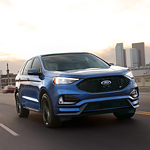 The 2019 Ford Edge ST is a pleasure to drive and one of the top vehicles in the midsize SUV market, as rated by US News & World Report. The latest models have more performance than in any previous lineup, and the redesign has people turning their heads to take a second look at this beautiful SUV. The grill, headlamps, fog lamps, and body style have all been upgraded to a sportier look. While the non-ST trims focus on comfort, you’ll get both with the Edge ST. While this is the premium model of the Edge, it still doesn’t carry the premium price tag. The ST ramps up the performance with a twin-turbocharged V6 engine that can put out 335 horsepower and 380 pound-torque. You can haul anything you desire with this powerful SUV, but it’s the handling and suspension that will make you fall in love. Want to test drive the all new Edge ST? Stop by Tracy Ford.